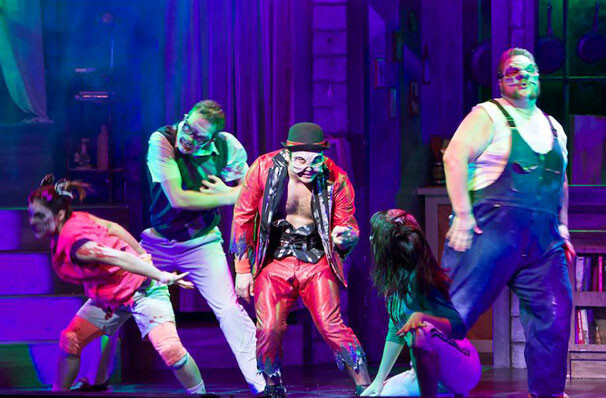 Why See Evil Dead - The Musical? The immensely popular musical horror spoof lovingly lampoons Sam Raimi's 80s cult classic horror films - all here in Sin City! EVIL DEAD follows five college kids who travel - typically - to a cabin in the woods and accidentally unleash an evil force, natch. But although it may sound like a horror story, it's not! The songs are campy and the show bursts with more farce than a Monty Python hot air balloon. There's knowing dialogue that completely roasts the teen horror genre, and a fast-paced plot that will have you rolling in the aisles. 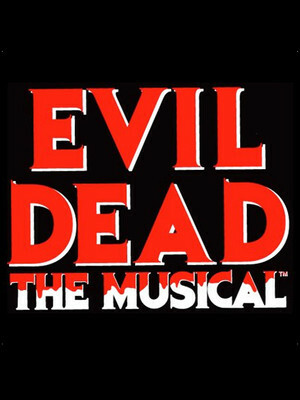 EVIL DEAD: THE MUSICAL unearths the old familiar story: boy and friends take a weekend getaway at abandoned cabin, boy expects to get lucky, boy unleashes ancient evil spirit, friends turn into Candarian Demons (natch), the lone boy fights until dawn to survive. As musical mayhem descends upon this sleepover in the woods, 'camp' takes on a whole new meaning with uproarious numbers like "All the Men in My Life Keep Getting Killed by Candarian Demons", "Look Who's Evil Now" and "Do the Necronomicon". The Splatter zone are the first few rows up front and that's where you can experience the 4D element of the show, all those seated in the Splatter Zone will feel the blood of the undead spray as Ash battles the Undead in an all out Brow-fest! 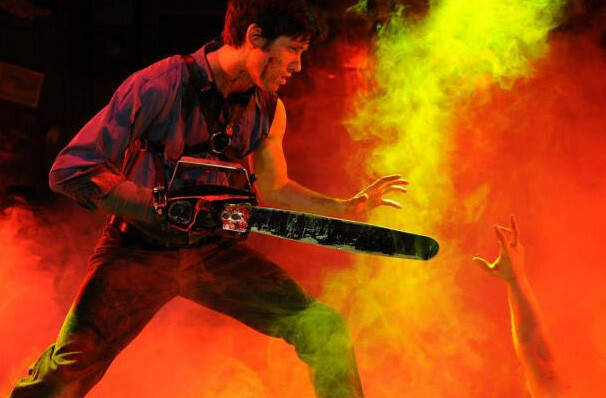 Seen Evil Dead - The Musical? Loved it? Hated it? Sound good to you? Share this page on social media and let your friends know about Evil Dead - The Musical at V Theater. Please note: The term V Theater and/or Evil Dead - The Musical as well as all associated graphics, logos, and/or other trademarks, tradenames or copyrights are the property of the V Theater and/or Evil Dead - The Musical and are used herein for factual descriptive purposes only. We are in no way associated with or authorized by the V Theater and/or Evil Dead - The Musical and neither that entity nor any of its affiliates have licensed or endorsed us to sell tickets, goods and or services in conjunction with their events.